The holiday frenzy has not stopped me from falling in love with some gorgeous found objects... Let me share my latest finds, one sweeter than the other!! Why, oh why, is it so easy for me to fall in love...?!! 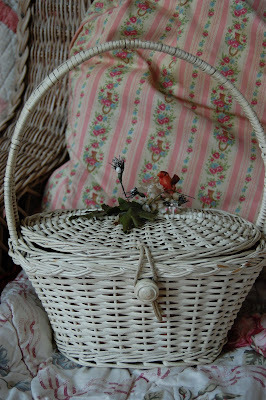 This darling little basket was absolutely irresistible... Found in my friend Randy's space. 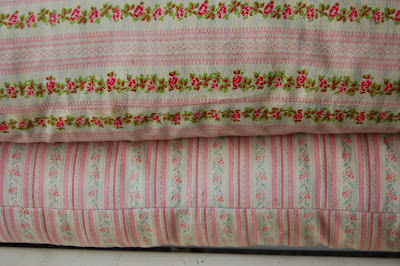 I bought these sweet vintage ticking pillows from Barn House... You know I cannot resist pink! This adorable vintage American Red Cross drawstring bag was found in my friend Sue's booth. 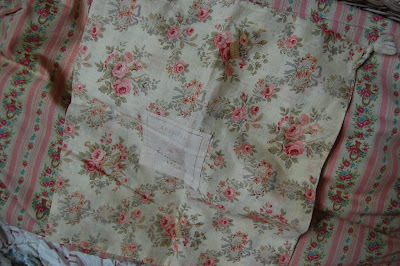 It has one of the prettiest fabrics I have ever seen, I am so in love!!! 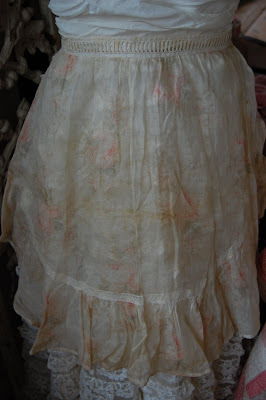 It is hard to see, but this vintage sheer apron features the loveliest faded roses... A keeper for sure! 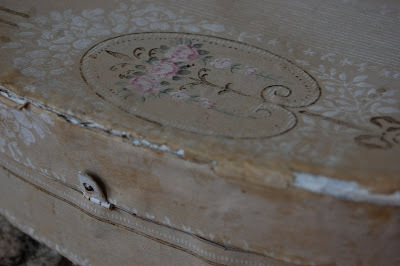 From my friend Debbie came this awesome vintage wallpaper box, torn and tattered just like I like it!! 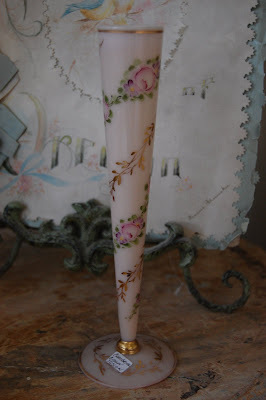 I found this sweet little bud vase for my mom (it's okay, she does not have a computer and does not read my blog! ), her birthday is coming up soon and I will be mailing it to her! I collect the vintage ticking too. :0) I have two of those designs. My latest find has been a piece of ticking with a lavender stripe...had never seen that color before and it's vintage. Wow! I love the wallpaper box such a sweet find. I hope this New Year brings you happiness and joy. What beautiful finds, Isabel. In my own small way, I've found some vintage loveles here in Edinburgh over the last two days, too! Have a very happy New Year. Your wallpapered box is an old "Evening in Paris" perfume box. 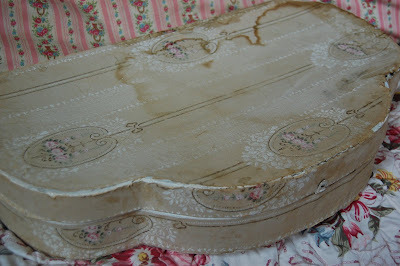 I found one in my basement (my treasure trove) and am thinking of using some of my vintage wallpaper to decorate it! Thanks for sharing. I totally looked at that basket purse in Randy's space and when I went back to see if it was still there, it was gone. I should have known you would have bought it. It's adorable. Put a sticker on it for me. ha ha Movie tomorrow night? Isabel, everything looks so beautiful together!! !